NLB manages the National Library, 26 Public Libraries and the National Archives of Singapore. NLB promotes reading, learning and information literacy by providing a trusted, accessible and globally-connected library and information service through the National Library and a comprehensive network of Public Libraries. By forging strategic partnerships to cultivate knowledge sharing, the libraries also encourage appreciation and awareness of Singapore’s history through their wide range of programmes and collection on Singapore and regional content. The National Archives of Singapore oversees the collection, preservation and management of public and private archival records, including government files, private memoirs, maps, photographs, oral history interviews and audio-visual materials. Established on 1 September 1995 as a statutory board, NLB is an agency under the Ministry of Communications and Information (MCI). Readers for Life, Learning Communities, Knowledgeable Nation. We make knowledge come alive, spark imagination and create possibilities. 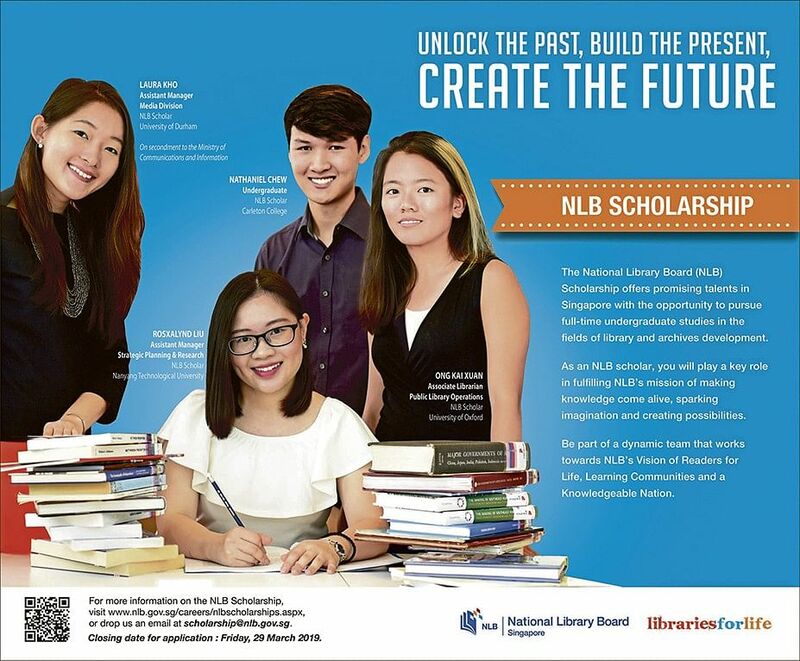 The objective of the NLB Scholarship is to develop & nurture a pool of talent with the capability and potential to assume future leadership roles and champion NLB’s mission of making knowledge come alive, sparking imagination and creating possibilities. Our scholarships offer promising talents in Singapore the opportunity to pursue full-time undergraduate or postgraduate studies in fields to advance library and archives development and also to grow domain expertise in various knowledge fields. The NLB Postgraduate Scholarship s a fully-funded programme that covers tuition and other compulsory fees, return airfare (for overseas scholarship), maintenance and other allowances (where applicable). Scholars can choose to study locally or at renowned universities overseas. Postgraduate studies in fields to advance library development and to grow domain expertise: Library Science, Information Science, Southeast Asian Studies, South Asian Studies, History, English, Chinese, Literature, Geography, Contemporary China, etc.